Dirty Dancing | WHAT A FEELING! Is the sleeper success of Dirty Dancing going to prompt a wave of dance movies? Could be, and Salsa is an early imitator, but with a Latin beat. The story of Salsa, if it can be called a story, concerns a young garage mechanic (Robby Rosa, formerly a member of the prefab pop group Menudo) who supports his mother and sister while he dreams of winning a salsa dance contest that would send him to a big competition in Puerto Rico. In a way, the movie is a Latin version of Pal Joey. The hero’s a bit of a cad, and he’s torn between two other dancers—his sweet, simple girlfriend, and an older, wealthier dancing master who’s something of a witch. Which will he choose? Will he jeopardize his chances of winning the competition? Will he resist the temptations of yet another romantic interest, the obligatory curled-lip spitfire? Will he allow his willowy younger sister to date his best friend? The answers to these and other questions are pretty easy to guess, and director Boaz Davidson tries to distract from the formulaic nature of the script by finding as many excuses for dirty dancing as possible. In some cases, Davidson and Ortega conjure up settings for dances that recall the classic Hollywood musicals, such as a duet that takes place in front of a tropical-island billboard. But the explicit nature of the dancing detracts from the charm. The steamiest number takes place inside the hero’s garage apartment, when he and the aforementioned spitfire engage in some heavy pawing. The guy even has a glittery silver ball that hangs and rotates from his bedroom ceiling, which is a new wrinkle in personal make-out accessories. It shouldn’t take long for other Dirty Dancing clones to arrive. For that matter, Dirty Dancing II, which will pick up the story of the original film’s bump-‘n-grinders a few years later, is already in the works. While we wait for that, a selection of unauthorized substitutes will doubtless be available. Who can forget Salsa, or the Dirty Dancing follow-ups? I can, of course—I’m not an idiot—but it’s harder to forget the feeling of sitting through this phase of cheap moviemaking. Another knock-off from the Cannon Group. Most of Dirty Dancing is a pretty bad coming-of-age movie about a girl (Jennifer Grey) who undergoes some major rites of passage during a summer spent with her family at a Catskills-like resort. This much of the movie is labored and familiar. The film goes completely out of whack by including liberal doses of really wild dancing scenes (choreographed by Kenny Ortega). Teen-age Grey falls in with the resort’s entertainers, led by a chap (Patrick Swayze) who has definitely, shall we say, waltzed across the floor a few times. 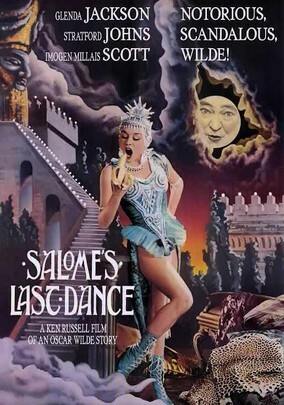 Thus the film is punctuated by repeated scenes of crazily lascivious dancing, the kind that Grey’s parents are always warning her about (the film is set in the 1960s). I suppose these dancing scenes are no less ridiculous than the rest of the movie, but at least some of the dancing’s exhilarating. Patrick Swayze, who has had tough-guy roles in such films as Red Dawn, actually is a former ballet dancer, so he needs no stunt doubles for the dance sequences. He seems to take the rest of the movie a bit too seriously, however; he glowers meaningfully through much of the film. The thing that holds what there is of the movie together is Jennifer Grey (daughter of Joel Grey), who was funny as the hapless littler sister in Ferris Bueller’s Day Off. She has a likably “normal” screen presence, unaffected and smart, and she tries endearingly hard in the dancing scenes. The other actors are at sea, because the film, directed by Emile Ardolino, doesn’t really know what it’s doing. Jerry Orbach plays Grey’s father, a doctor who expects his little girl to be a princess at all times. Cynthia Rhodes, another ex-dancer (she was one of the unfortunates stranded in the Travolta-Stallone travesty, Staying Alive), has to simper as an entertainer who undergoes the obligatory pregnancy and back-alley abortion. That’s typical of the cliché plot twists in Eleanor Bergstein’s script. What isn’t typical in Dirty Dancing is the sometimes genuinely giddy back-and-forth between the outrageous dance scenes and the regular dramatic stuff. The audience that saw the film at the latest Seattle International Film Festival had no idea what to do with the movie, but they seemed to enjoy it. Which was an understandable reaction. It became a phenomenon, for some justifiable reasons. A lot of the film’s nuttiness and zest can be ascribed to Emile Ardolino, who came out of TV and especially dance documentaries; he subsequently directed Chances Are, a very nice comedy that had some similarly happy qualities, and had another hit in Sister Act. I interviewed him at the time of Chances Are and the guy was a mensch. He died at the age of 50, from AIDS-related causes.